There can be many different causes of depression. It is not a one size fits all medical disorder. We have all been depressed at one time or another since being blue from time to time is a normal part of life. What makes depression different from the normal ‘blues’ is that there is usually a deeper reason associated with its occurrence. Because of this, the disorder’s effects usually linger. It isn’t a mood that a person can just ‘snap out of’ or ‘get over.’ Usually there is a root cause of depression that serves to trigger a mild , medium or severe form of the condition. While there are many different factors that can lead to depression scientific studies show that most people develop this disorder due to one or more of the following reasons: prescription drugs, medical problems – both chronic and one time physical complaints, certain events that trigger feelings of loss, helplessness or grief, life changes, genetics, and a side effect of having a medical disorder that disrupts the mental aspect of the brain such as bipolar disorder. Even people who have previously been known to really enjoy life can feel hopeless and become depressed upon developing medical conditions that are chronic in nature. It is very important that anyone with one of the risk factors of chronic illness and/or chronic pain seek treatment for their emotional illness as well as their physical illness as left untreated thoughts of suicide can become more prevalent. Either trauma or abuse or a combination of the two can trigger a lowered emotional state. No matter whether the trauma was the result of a sudden event such as a car accident or the verbal, emotional and/or physical abuse occurred over a prolonged period of time the affects of such events need to be dealt with emotionally. A licensed counselor or medical professional is usually the best option for those experiencing a lowered emotional state due to this underlying cause. Loss can bring about intense sadness and the pain of grief. Although many people experience these emotions upon a loss, particularly the loss of loved ones, if these emotions persist or manifest themselves in unhealthy ways such as reckless behavior, these feelings can develop into depression. Although some people move through the emotional upheaval that comes from a loss without finding help, many people do reach out via support groups, therapy and medical assistance to help them resolve the feelings they have about the loss. It should be noted that death is not the only loss that can bring about this disorder. Other losses can also lead to this condition including loss of a relationship, a move, financial loss, and other life changes and events which may not commonly be associated with causing this mental state. Sometimes people become depressed when their body changes. Although it can sometimes be hormonal in nature it may not always be. It could be tied in with the feeling of loss mentioned above. For example, depression in women may be brought on by hormonal changes associated with pregnancy or maternal depression which can occur after giving birth. It could also be caused by the feelings of loss for her old life which accompanies the major life change of having a child. Older men who have had a stroke or heart attack are at greater risk of becoming depressed than those men who have not experienced one of these medical problems. Some people experience a form of depression that occurs after a physical ailment has been treated. These people can often feel depressed and not know why. This usually happens once a person realizes that he or she will not recover fully from the treatment and they will be living with a new ‘normal’ for a long while and/or permanently. For example, an active man who has knee surgery only to find he is unable to engage in all of the same activities he did prior to the surgery or at the same level of involvement may experience depression months after his initial surgery. A depressed state can sometimes by an unwelcome by product of stress. Stress over a job loss, financial worry or family matter can manifest itself in feelings of sadness and a lowered energy level. Genetics is known to play a role in the development of this condition. There is some controversy over the exact extent that a family history of depression plays into this but it is well accepted that if a family member -particular a close relative – has depression or a mental disorder then the greater the chance a person has of developing the disorder. Genetic pre-disposition could also be exacerbated by additional factors since it is likely that a close relative and the person with depression share many common experiences over time. Certain mental disorders such as bipolar disorder and manic depressive disorder have depression as one of their main affects. Usually drugs will be prescribed for those who suffer from a diagnosed physical illness such as one of these disorders. In such a case it is important that the person suffering from such a condition take the medication as prescribed in order to maintain a mental balance. Depression can occur in all ages. Here are the most common reasons each of the following age groups experience this medical condition. It should be noted that these are the most common causes and may not be definitive in a particular individual’s circumstance. One of the most common depression myths is that depression is just a disorder experienced by adults. That is not so. In fact, childhood and teenage depression can and does occur. If a medical condition has been ruled out, a child’s depression is usually found to be caused by abuse or feelings of loss or grief. It is often difficult to pinpoint the exact cause of teen depression since a low emotional mood is often chalked up to just ‘being a teenager” and it is considered normal for a teenager to have strong feelings and show the emotional symptoms of a depressed person. Care should be taken to take seriously a teenager’s depressive state as the cause of even a mild to moderate form of the disorder should be addressed. Depression in teenagers is often but not always the result of hormonal changes, from a medical disorder, or feelings of loss or grief from either a recent or previous trauma. It should be noted that a common side effect of the popular acne drug Accutane is depression. So, any teenagers or young adults taking the drug should get help immediately if feelings of sadness and hopelessness persist. 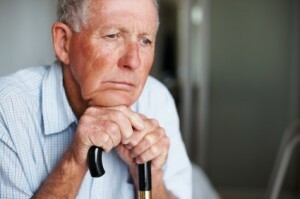 Depression in the elderly is much more common than most people realize. The most common factors leading to depressed seniors are: medical problems including but not limited to chronic illness and pain, loss of loved ones or a previously enjoyed ‘way of life,’ prescription drug use and, if money worries are a concern, stress. Knowing these various causes is not just about understanding depression. Most important, it is that by knowing the underlying cause(s) of a person’s depressed state it increases the chances of effectively treating it and getting that person back to enjoying life again. For information on how to treat depression please click here. To see the common signs of depression please visit our Signs of Depression page. Serotonin – The Link to Depression? Anxiety and Depression – What’s the Connection?